Without proper time management and employee scheduling, running your food truck business can quickly get out of hand. Your employees are an important component to your business that can turn your business into a profitable venture if you plan their shifts properly. Make a list of all your current employees. Before you can create a fully functional schedule, you must know every member of your team. Create a list of available work hours you need filled. On days when you’re catering events, you may have more hours available than days where the truck is making only regular stops. Depending on the tasks you need completed each day, your employee shift schedules can be as short as two hours and as long as eight hours or more. Separate your employees into two groups: full time and part time. If an employee works only part time, he likely won’t work as many days as your full-time employees and will typically work shorter shifts. 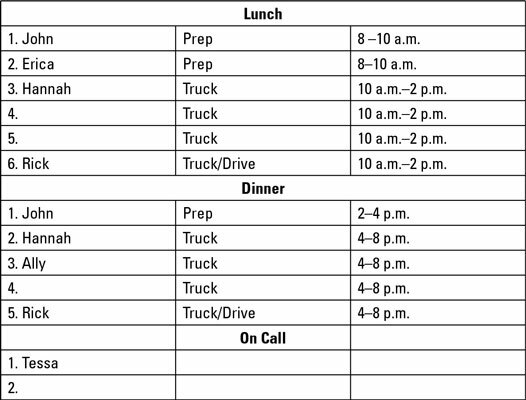 This shorter schedule allows you to schedule part-time employees to help prep the food before it’s loaded onto your truck or to meet the truck after hours to clean it for the next day. If you have a large enough group of employees, create a form so each employee can choose his preferred work schedule. Knowing your employees’ preferences helps you place them in an available work shift that’s convenient for everyone. Set up defined ground rules for the employee schedule. For longer work shifts, create specified times for short breaks, lunch breaks, or dinner breaks. If a scheduled shift is extremely short (less than four hours), make sure the employee understands and agrees to no breaks or unscheduled breaks. You’ll also need to restrict the number of work hours for an individual employee to allow him to maintain his current work status. Post the work schedule at least one week in advance. Doing so gives your employees an opportunity to review the schedule and allows them to notify you ahead of time if any changes need to be made before the week arrives. To give your employees confidence in giving you advanced notice of scheduling issues, assure them that if a conflict occurs, you’re willing to work with them. If you can, try to keep the same schedule each week so your employees can get into as much of a routine as possible. Because of the nature of the mobile food industry, you won’t always be able to maintain the exact schedule from week to week, but giving your employees some order is better than none at all. Make schedule changes as far in advance as you can. The more notice your employees have, the better your whole team will function. You can save yourself some time by setting up your employee work schedule in a spreadsheet or other computer program. You can then use that same program to keep track of expected work hours and planned time off for yourself and your employees.